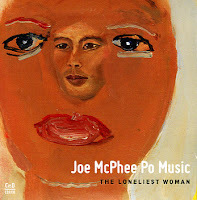 With its thirteen minutes and twenty seconds, this is a short album, with only one track, Ornette Coleman's super "Lonely Woman". The band is Joe McPhee with the "fine fleur" and "crème de la crème" of Alpine free jazz in the early eighties, Andre Jaume on tenor saxophone, Daniel Bourquin on baritone saxophone, Michael Overhage on cello, Radu Malfatti on trombone, Raymond Boni on guitar, Irene Schweizer on piano, Francois Mechali on bass, Pierre Favre on percussion, and Tamia Valmont on vocals. The track was recorded in Boswil, Switzerland on March 25th, 1981 and only now released. The eleven musicians make this a very rich listening experience, starting with the bass introducing the piece, followed by cello and guitar, who create a shimmering harplike background, then the horns set out for the grand theme full of sadness and hope. This then evolves into a chaotic moment of full dispair, with the piano giving some structure back, yet full of sentiments of hesitations and shifting emotions. Distress ensues, with McPhee's pocket trumpet soaring over the rest, pushing the band into near silence near minute ten, the moment for Tamia Valmont to start her vocal part, a wordless chant of sadness, rage and crushed expectations. The whole band picks up the theme again for the finale. Certainly not the best performance of the song, yet a really nice one among the larger bands. The great thing is to hear it being played after thirty years. Fans should definitely try to get their copy. And isn't this composition just miraculously beautiful?